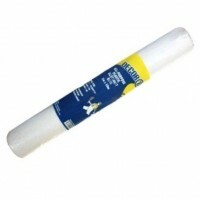 We stock a variety of sizes and strengths of both dust sheets and polythene TPS which provide maximum coverage and protection for all those messy jobs you undertake. 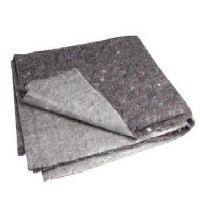 Easy to store, unwrap and re-use for other jobs too making them great value for money. 5 ROLLS CLEAR POLYTHENE DUST SHEET ROLL ON CARDBOARD CORE FOR EASE OF USE EACH ROLL MULTIFOLD ..
8 ROLLS CLEAR POLYTHENE DUST SHEET ROLL ON CARDBOARD CORE FOR EASE OF USE EACH ROLL MULTIFO..
Builders Temporary Protective Sheeting (TPS) IDEAL FOR MANY USES COVERING, DUST PROTECTION ETC..
1x Stair fleece dust sheet Reusable, absorbent surface and slip-resistant impermeable underside. ..
10 x Natural Cotton Twill Dust Sheet 100% Cotton Twill For long Life ALL LARGE 10 ..
10 ROLLS CLEAR POLYTHENE DUST SHEET ROLL MUTIFOLD OPENS OUT TO: 4M X 25M .. HEAVY DUTY DUTY DEFENDER COTTON CANVAS DUST SHEET Pack of 10 SIZE 2.7M X 3.6M (9FT X 12FT) ..
10 x Natural Cotton Twill Dust Sheet 100% Cotton Twill For long Life (12ft x 9ft) approx Pr.. 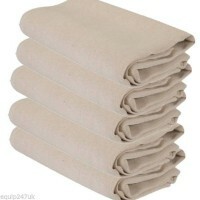 PACK OF 10 Natural Cotton Twill Dust Sheet 24' X 3' STAIR RUNNER 7.2m x 0.9m approx ..
10 ROLLS CLEAR POLYTHENE DUST SHEET ROLL ON CARDBOARD CORE FOR EASE OF USE EACH ROLL MULTIFOLD..
10 Sheets Sandpaper Set Mixed Grits 40,60,80,100 & 120 Grit Great value pack of 10 sheets of ..
10 x ECONOMY COTTON TWILL LAMINATED DUST SHEET Each Sheet comprises SIZE: 3.6M X 2.4M COTTO..
10 x Natural Cotton Twill STAIRWAY Dust Sheet 100% Cotton Twill For long Life LONG STAIRWAY SH..
12 x Natural Cotton Twill Dust Sheet 100% Cotton Twill For long Life (12ft x 9ft) approx Pr..
12 x Natural Cotton Twill Dust Sheet 100% Cotton Twill For long Life ALL LARGE 12 ..
12 ROLLS CLEAR POLYTHENE DUST SHEET ROLL MUTIFOLD OPENS OUT TO: 4M X 25M ..